12 Fresh Songs Recorded Live in London and Sydney. Recorded live in London, England and Sydney, Australia, this always highly-anticipated Hillsong album features the coming together of the Hillsong worship team from around world including Reuben Morgan, Joel Houston, Ben Fielding, UNITED and international teams from London, Stockholm and Cape Town. Since 1992, Hillsong has resourced the local church and received gold and platinum album status multiple times, writing such well known worship songs as "Shout To The Lord", "Inside Out", "Hosanna", "The Stand", ?Mighty to Save? and most recently the highest debuting song on the most recent CCLI chart, ?Cornerstone?. The deluxe album includes 12 fresh new songs including ?Man of Sorrows?, "Glorious Ruins", "Christ is Enough", "Anchor" and "Where The Spirit of the Lord Is" plus bonus songs and video. Hillsong is the congregational expression of worship from Hillsong Church - a local church with global influence that has a commitment to continually resource the Body of Christ with fresh songs of worship and a deep passion to see people connect with the Living God in a real and personal way. 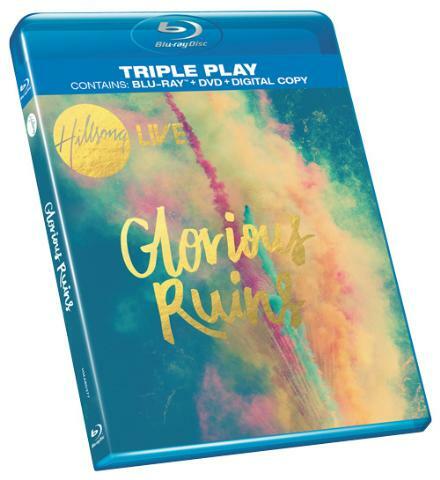 Glorious Ruins Blu-ray by Hillsong was published by Hillsong in July 2013 and is our 12347th best seller. The ISBN for Glorious Ruins Blu-ray is HMABD277. Be the first to review Glorious Ruins Blu-ray! Got a question? No problem! Just click here to ask us about Glorious Ruins Blu-ray.